Spredfast is a social media management program that allows businesses to centralize all their social media initiatives in one place. It enables users to evaluate their social media campaigns through extensive reporting and analytical functions. We compiled reviews from our website and from around the web and determined that Spredfast has generally positive ratings. Users who gave Spredfast a positive review said that it is a great app for cross-platform publishing, social listening, and community management. They also said that the app’s interface is intuitive and user-friendly. Great customer support and regular training sessions for product updates were also cited. Users who gave Spredfast a negative review said that the app’s pricing structure can be a little expensive for small businesses. They also complained about occasional bugs and glitches. “The metrics are updated throughout the day, allowing for real-time analysis and customer care. It allows you to see your company performance compared to competitors, and see what users across channels are saying about you and your competitors. Terrific cross-platform posting workflow management. The user interface is well-designed and intuitive for the most part. Most importantly, their customer service is top-notch. Follow-up and follow-through for questions or concerns are timely and thorough. Spredfast also performed a thorough analysis of our current Social Media strategy and made recommendations (for a consultation fee, but it was well worth it). Spredfast doesn’t publish its pricing plans online. However, services from providers similar to Spredfast usually cost around $0 to $99 for apps with basic and straightforward functionalities, while more extensive ones cost around $99 to $599+/month. Interested users may get in touch with the Spredfast sales team to request for a quote. Check out the list below of some of Spredfast’s features. How to Create a Facebook Business Page in 6 Steps – A Facebook business page is a free public profile you can create for your local business, brand, or product. Check out this article where we go through the steps of creating a Facebook Business Page. Does Spredfast offer a free trial? There was no mention of a free trial on Spredfast’s website. However, interested users can request for a free product demo to learn more about how the platform works. Do I need to pay for the product demo? No. Simply fill up and submit this form to request for a demo. What are the devices supported by Spredfast? Spredfast supports desktop, Android, and iOS devices. This video provides an overview of the key features of Spredfast and what it can do to make social marketing easier for businesses. Not sure if Spredfast is the right fit for you? Read our reviews of all top social media management software or check out one of these three Spredfast alternatives. They have a very user-friendly interface. And their platform evolves as quickly as the social platforms do. It’s very expensive for what you are getting. There are several other platforms out there that offer the same services but come at a much lower cost. How easily I could have saved money by utilizing another vendor for similar services. The metrics are updated throughout the day, allowing for real-time analysis and customer care. It allows you to see your company performance compared to competitors, and see what users across channels are saying about you and your competitors. Terrific cross-platform posting workflow management. The user interface is well designed and intuitive for the most part. Most importantly, their customer service is top-notch. Follow-up and follow-through for questions/concerns is timely and thorough. Spredfast also performed a thorough analysis of our current Social Media strategy and made recommendations (for a consultation fee, but it was WELL worth it). Their training videos are based on an older version of the platform. 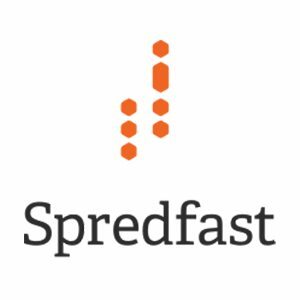 I know the Spredfast team is actively looking at how to improve training, and I look forward to updated videos and help files in the relatively near future. I wasn’t involved with the purchase, but would have liked to know the full capabilities and limitation of the metrics analyses offered. Spreadfast is a great all-in-one platform that helps social media teams with publishing, social listening, and community management. Unfortunately, there are some glitches they are still working out. Also, Instagram scheduling would be helpful. Not all content types are supported. There are sometimes bugs in the system that make it slow to use. There should also be a phone hotline to call for customer support instead of via email. Great all-in-one platform that can help with approval flows, cross-platform publishing, social listening and community management. Pricing structure is definitely geared more toward larger businesses. The platform does experience technical glitches regarding, most recently preview updates and editing link information (headline and description). Not all channels or post types are supported (ie. carousel) and not the best for scaling paid/dark content.